Sparkling wine, champagne, prosecco – this is, to me, the perfect wine. You can serve it to your sweetie with breakfast in bed; order it with a celebratory lunch, or woo your significant other with it prior to a romantic dinner for two. It’s also great with cheese and crackers as you sit on the beach. I am a sparklingwineaholic and I’m not ashamed of it! To get us started, let me run down the order of driest to sweetest in the sparkling wine lingo. Ready? Thank you, Wikipedia ! (I will say, I don’t know if I’ve ever drunk an “Extra Brut” sparkling wine – though I have had a Natural.) So, Dry = sweet. I can’t handle sweet sparklers any more – Asti Spumante is not my thing, but lots of people like it. Most of the wines below fall in the “brut” category. There ARE sparkling wines out there under ten dollars and over the years, I’ve tasted them all. Well, almost all. But I’m bringing you my favorites first, those that haven’t seen a ten dollar price tag in years – if ever. I mentioned one of my favorites, Etoile by Chandon, last week and you can find that post here. Go all the way to the bottom of the post, and you’ll see the gorgeous bottle. Last week, the hubby found it at BevMo for under $20 – but don’t expect to find it for that price for very long. Their lesser-priced sparklers, Domaine Chandon Brut and the Brut Rose are very good – and contrary to my faulty memory last week, usually go for $11.99 at Vons on sale. Not a bad price at all! I’ll squeeze Piper Sonoma Brut in here, as it’s in this same price range between $11.99 and $14.99 on sale, depending on who’s doing the pricing at Vons that day. (Just kidding…) Also a great value, terrific flavor, a real nice sipping sparkler. Another tasty favorite is by the Mumm’s brand. Mumm’s Cuvee Napa with the dark blue label is another go-to bottle for me This usually goes for $14.99 at Vons on sale – when I can find it for lower, I grab two bottles, just in case. Right now, I believe it’s at $13.99. Mumm’s also has another, black label champagne that runs the same price but it’s just a little different. Going pricier, and unfortunately no longer available, is the French Moet & Chandon’s White Star non-vintage champagne. It ran around $50 full price a year or so ago, but you could usually find it in the $30’s price range (and I remember when it was really expensive at $25 a bottle). This wine won all sorts of awards, and in 2010 M&C pulled the plug on it. You can’t find it anywhere, it’s not being made, and those people who have a case stowed away in their wine cellar aren’t talking – and they’re not selling, either. A real disappointment. There’s a reason Veuve Clicquot Ponsardin Yellow Label is a favorite of mine. It was one of the last Christmas gifts my brother Scott gave me. Plus, it’s tasty! Another non-vintage champagne from a terrific house. This wine is found in wine shops – maybe your grocery store around New Year’s eve. You can also find this at BevMo for about $35 – it’s got a traditional, French yeastiness to it (or, maybe that’s just me) that I really like. On the splurgy side, but hey – the bubbles are REALLY small. If you want to spend the big bucks to impress that special someone who’ll know you spent the money (I’m talking between $120-$150 per bottle), then you want to go for the Veuve Clicquot Grande Dame 1998 vintage. I had the 1996 vintage – and it was superb. Others that I’ve had that are on the pricier side of things: Roederer Estate Brut, about $25. Schramsberg Blanc de Blanc, $36. Piper Heidsieck Brut Cuvee, $45. These are all straight prices found on the internet, no discounts or sales. If you look about, I’m sure you’ll find them for less. On the less expensive side of things, I do appreciate Korbel Brut. The low man on the totem pole is often under $10; if you go for Korbel Natural (with the green label, instead of the white label), it goes up a bit to around $14.99 and can be considered on a par with Piper Sonoma. But this is the sparkling wine without any sugar added (see table, above). BAREFOOT also puts out a decent sparkling wine, and it’s around $8.99. I’ve had it, I liked it, and I will buy it again, but it’s not my all-time favorite. ONES TO STAY AWAY FROM: (And please remember, this is just my opinion!) Cooks , $5.99. Frexienet (the black bottle), $7.99. ANYTHING under $4. These wines tend to be sweeter than the others and have big bubbles, both of which will give you a huge headache the next day (or maybe that same night). They might be okay if you’re using them for mixed cocktails; but still, buyer beware. I speak with full knowledge of both these wines. Way back at the dawn of time, when I was young and unemployed, my best friend Tammy and I would sit and drink Cooks or Frexienet and eat french bread pizza and watch General Hospital (this was the Luke and Laura wedding year). I have put money into those bottles, and loved them well at the time. Now, however, I like to think my palate has grown more sophisticated and as such, I can’t – literally, can’t – drink these wines. (They’re really too sweet.) This doesn’t mean that you can’t drink them and enjoy – as I am sure many people do! They definitely fill a niche in the market. Whatever you choose to do this New Year’s Eve, whether it be to curl up with your new Kindle Fire or to party hearty in Las Vegas, may you have a safe and joyous New Year’s Eve. Cheers – and remember to drink responsibly! The opinions above are mine and mine alone, based on years and years of taste-testing Champagnes and Sparkling Wines. If YOUR favorite sparkling beverage wasn’t listed here, feel free to send me a bottle and I’ll be happy to give it my thorough attention – and an honest review. This entry was posted in Wine Friday and tagged Asti Spumante, Barefoot, brut, brut rose, champagne, Cooks, Domaine Chandon, Etoile, Frexienet, General Hospital, Korbel, Moet & Chandon, Mumm's, New Year's Eve, Piper Heidsieck, Piper Sonoma Brut, prosecco, Roederer Estate Brut, Schramsberg Blanc de Blanc, Sparkling Cider, Sparkling Wine, Tammy Baar, Veuve Clicquot, Wikipedia. Bookmark the permalink. I am so glad I met you this year–and it was just by chance. Our meeting and friendship gives me hope for serendipity. Y’all have a great new years! Catie, you are definitely a bright spot in my 2011…serendipity lives, indeed! As for the sugar content – it drives me crazy that people who don’t know think that “dry” sparkling wine is in fact dry. It’s not. It’s sweet. Made that mistake once about 20+ years ago, and haven’t ever made it again, lol! May 2012 bring you nothing but joys my dear! I don’t do well with Champagne. Which is strange really, because my mother in law (who was born in Europe) celebrates all special occasions with it, and I used to be able to drink it. Now it goes straight to my head and I feel woozy, flushed, headachy. Middle of the day celebrations are even worse. Why is that? Anyway, one champagne I used to like was Taitinger. Pricey, but not as bad as Dom Perignon, but still way up there. I don’t like any of the sparkling wines as they seem too sweet. Guess I’m going to have to stick to Pinot Noir and then have an Alka Seltzer for some bubbles. Ha ha. Taittinger is a good one, too. The headache thing may be a result of the sugar – almost all champagnes and sparkling wines have sugar added to them, and your metabolism just may not handle that well any more. If you want to experiment, try the Korbel Natural – no sugar added – and see if that works for you. These are great tips for sparkling wines for New Year’s Eve. I was going out to get a bottle today — I’m taking your tips with me! Thank you and best wishes for a wonderful 2012! Sarah! Sending you a ton of hugs, woman. Hope you are doing well – and that you enjoy whichever wine you pick! Happy 2012! Thanks for the suggestions! I’m so glad we met this past year. I hope you have a wonderful and successful 2012! Rhonda, I, too am glad we met. Since getting a “real” job again, I’ve had a hard time twittering…but trying to get back into the swing of things. Here’s hoping for a fun and successful 2012 for us all! Champagne truly is the drink of the creative! Gruet puts out a decent bottle, not sure if you can find it in CA. Thanks for the ongoing fun of your blogs. 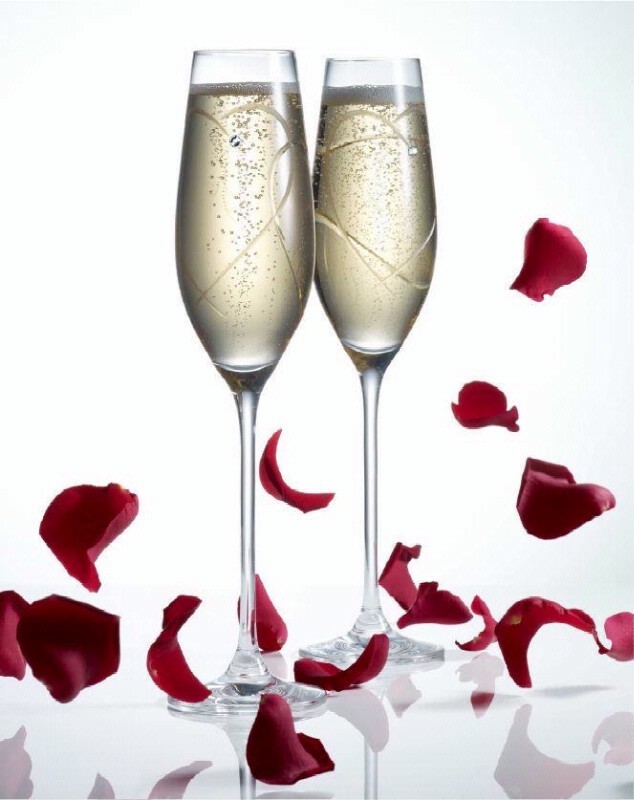 I love Champagne and have it as often as I can…:) Thanks for the tips too. Happy New Year. Happy New Year, Mary, and thanks for stopping by! Great information. I’ve wondered about sparkling wines. They’re not my fave, but I wondered if maybe I just didn’t try the right ones. Thanks, Christine! Happy New Year. Bought some Piper Sonoma Brut today to give to our neighbors when we play cards tomorrow night (yeah, I know, I’m old). So glad you approve! Gave Schramsburg Blanc de blanc to in-laws on Christmas day for NY. Yay me! thanks for your guidance this year. Looking forward to 2012 with you and wine time. Happy New Year, and I’ve got the VP binder whenever you want to come get it? Excellent post, Christine. We have some excellent ones down this end of the world too. I have a bottle Lindaeur special reserve chilling in my fridge, calling my name.